Hello Darlings,Somewhere between the leaves falling and the first snow fall, was my fantastic vacation to South Beach. Thanks to my trusty Starwood Preferred Guest Credit Card from American Express, I was able to purchase my flight and hotel stay with my hard earned Starpoints. I took off from Toronto Pearson Airport to spend five days in paradise enjoying the warm ocean breeze and the sandy shoreline with one of my close girlfriends. Once we landed at Miami International Airport we headed directly to W South Beach, the SPG property I booked with my Starpoints. As we were ahead of our check-in time, we took the liberty to enjoy our first mojitos, tuna tartars and fresh apple pie as prepared by Andrew Camellini at The Dutch. The meal became a daily lunch routine while there, with a different homemade pie each day! 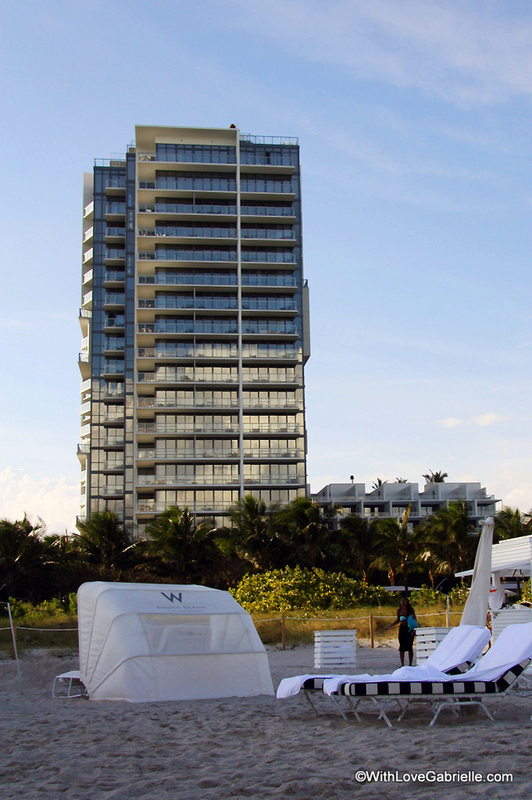 The W Hotels worldwide are famous for their lively and artistic atmosphere and the W South Beach definitely followed the recipe of a great crowd, modern design, exquisite cuisine and fabulous customer service. Their concierge service, or better known as the W Insider, is amazing and we have them to thank for our nightlife while there! (more on that in my next Miami article). Out favorite way to explore South Beach was along the boardwalk on bicycles. The hotel offers wicked retro bike services that make it easy for guests to just book a bike for a certain time and explore the city, all while having fun and looking stylish. We took advantage of the bikes a number of times, from shopping, to late night drive-bys on Ocean Drive. Overall, most of our activity took place around the hotel or based on the suggestions of our amazing W Insiders! The rooms at W Hotels are always very spacious and at the W South Beach they spared no expense. We were booked in a beautiful suite overlooking the ocean and the famous Collins Avenue. My SPG Credit Card from Amex is quickly becoming my go-to travel companion because of the amazing perks it offers. The Card allows me to earn Starpoints faster and easily redeem them when I want through the SPG website. It turned our vacation into an unforgettable experience and I can’t wait to go back! Hopefully this coming February or March I’ll have racked up the Starpoints on my SPG Credit Card again so I can book another trip to dip my foot into the ocean once again.